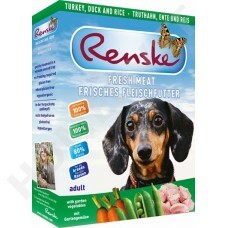 Renske fresh meat lining is composed of a mixture of the very best natural ingredients. The main ingredient of this product is turkey & duck, the meal also includes whole grain rice and vegetables. 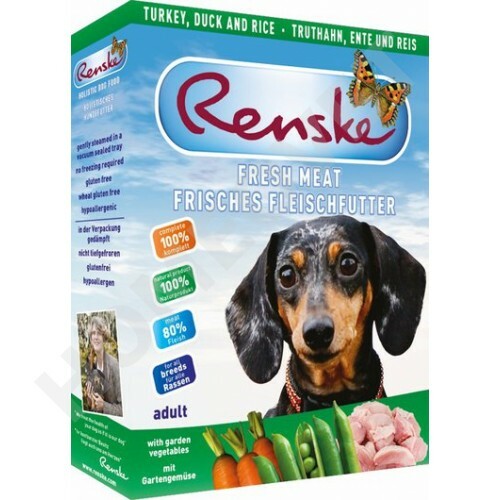 Renske fresh meat feed is enriched with Scottish salmon oil (for a shiny coat and optimal development of the brain), glucosamine and Chondrointin (to support the joints and joint capsules). The product also contains a variety of natural antioxidants to fight free radicals in the body of your dog. Our pure, fresh, natural ingredients are vacuum sealed and gently steamed to preserve the valuable nutrients. Fresh turkey meat (60%), fresh duck meat, whole-grain rice (10%), peas, carrots, seaweed extract, herbal vitamins & minerals, glucosamine, chondroitin. Administer food in room temperature. Residues may remain for 24 hours in a refrigerator. If necessary, you can warm this product in the microwave for 30-60 seconds. Then it must be consumed within 20 minutes. Once opened, keep refrigerated. * Contains absolutely no soy, beef, pork, peanut or milk products!